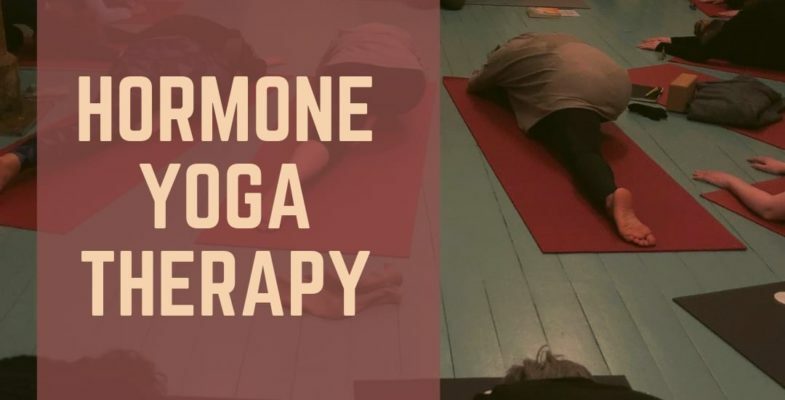 Hormone Yoga therapy (HYT) is empowering and woman focused. It was specifically designed by Dinah Rodrigues for women with complaints caused by hormonal imbalances. This workshop is een serie of 4 meetings, each of 2 hours. Please see dates below. HYT is a natural and holistic approach to reactivating hormone production. This therapy doesn’t involves medicine, instead, it strongly focusses on dynamically self-support techniques in achieving a healthier, balanced life-style. Hormone Yoga is suitable for women of all ages, with or without yoga experience. HYT involves a series of 14 detailed yoga exercises that stimulate and massage ovaries, adrenals, thyroid, parathyroid and pituitary glands – the whole hormonal system. It naturally increases the production of hormones in those glands and eliminates most of the symptoms experienced mostly during menopause. This therapeutical sequence is drawn from Hatha, Kundalini yoga and Tibetan Energy practices. Once women hit 35 our hormone levels start to drop and eventually we enter the menopause. There are all kinds of side effects to the imbalances that occur during this time: hot flushes, emotional instability, insomnia, anxiety, weight gain, fatigue, low libido, stiffness in joints, depression, migraine…and the list goes on. This therapeutic sequence helps women all over the world with menstrual problems, with difficulties to get pregnant, hirsutism, mood swings, hot flushes, hair loss, migraines, hypoactive thyroid, insomnia, osteoporosis, hair loss and others. WHAT you can expect from our workshop? At 8 hours workshop we will go through the whole sequence of therapy in detail. You will get the scripts with every single exercise described in it, so during the lectures you can take notes. Theory, practice and questions – this all will be on our program. After four repetitions of sequence at the workshops, you will be ready to practice at home with your scripts. Beside this, you will also learn several effective breathing and relaxation exercises which you can use in daily life. ADVANTAGES of hormone yoga therapy? Not only you will feel more balanced, beautiful, creative and healthy, there is one more special thing: You will learn this sequence only once, and forever – no other classes or workshops needed! After this workshop you can practice anywhere, anytime, at the intensity that fits you. With regular practice you will gain many positive results. The 4 sessions, 8 hours in total, will be held at the womanhood studio in Delft. For registrations please use our online momoyoga system. There is no refund if you decide to participate in part of the total workshop. Nicola Machalová graduated as a psychologist after five years of studying this field in Czech Republic. For her master thesis she specialized in dance-movement therapy techniques for infertile women. With her growing interest in body and movement, in 2016 she traveled to India and graduated as a yoga teacher. Soon afterwards she got certificated for Hormone yoga therapy in Brighton, UK.